“SMS, VOICE, EMAIL, FAX — WE WERE SPENDING A FORTUNE ON MULTIPLE NOTIFICATION SYSTEMS. EVEN WORSE, WE WERE FORCED TO SWITCH BETWEEN THEM MANUALLY, CAUSING DELAYS AND ERRORS. IT WAS TEDIOUS AND CREATED A NUMBER OF CUSTOMER SERVICE ISSUES. mandatory for your business success, revenue, and profitability. that integrates seamlessly with your back-end business systems. Just the way you envisioned it. operational efficiency, revenue streams, and profitability. as you’d like, knowing you’ll pay only for the notifications sent. No surprises – just excellent value. into a digital workflow that can be tracked, audited, and archived. notification that passes through our global infrastructure. Financial Services. Retail. Healthcare. Utilities. Telecom. Travel. Education. Government. And everyone else who needs to instantly reach their constituents. Creating a unified communications strategy has never been easier. 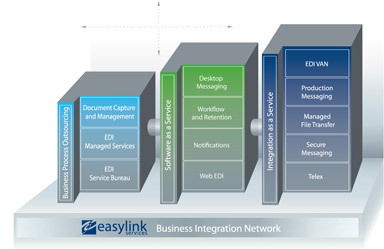 EasyLink® Services International Corporation is a leading global provider of on-demand electronic messaging and transaction services that help companies optimize relationships with their partners, suppliers, customers, and other stakeholders. The company provides a 100% outsourced one-stop shopping solution for both on-demand business messaging and supply chain services, creating attractive economies of scale with unparalleled quality and a single point of accountability. At the heart of our hosted services is the industry leading EasyLink Business Integration Network, a reliable, secure, and fully redundant global infrastructure that manages millions of transactions daily for our customers.